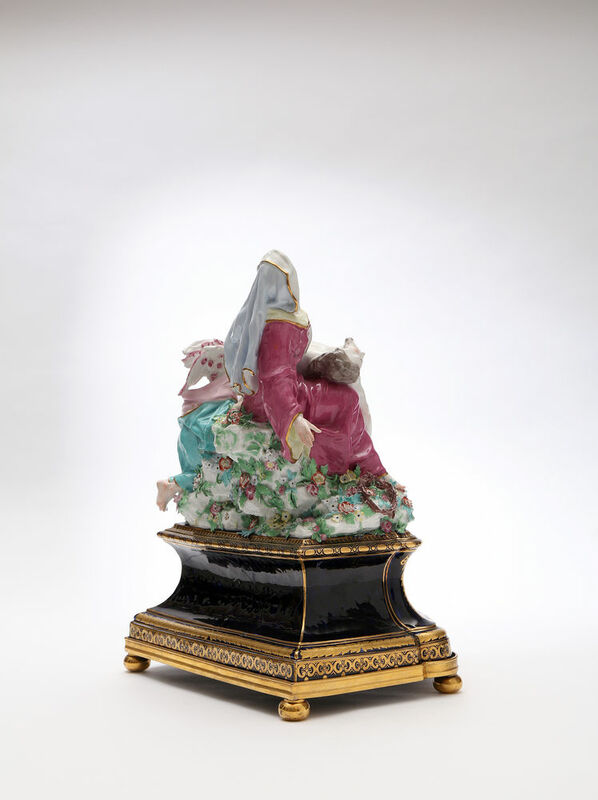 Roman Catholic devotional sculptures such as this Chelsea group of the Pietà, are rare in English porcelain. Here, the sorrowful Virgin Mary with a crown of thorns at her feet cradles the dead body of Jesus, his wounds still bleeding, while an attendant angel kisses his pierced hand. This passionate expression of grief representing the Lamentation of Christ in the Catholic liturgy was probably commissioned for private devotion when it was illegal in England to openly practice as a Catholic and mass was forbidden. Such Marian imagery became all the more important among elite recusant English Catholics. 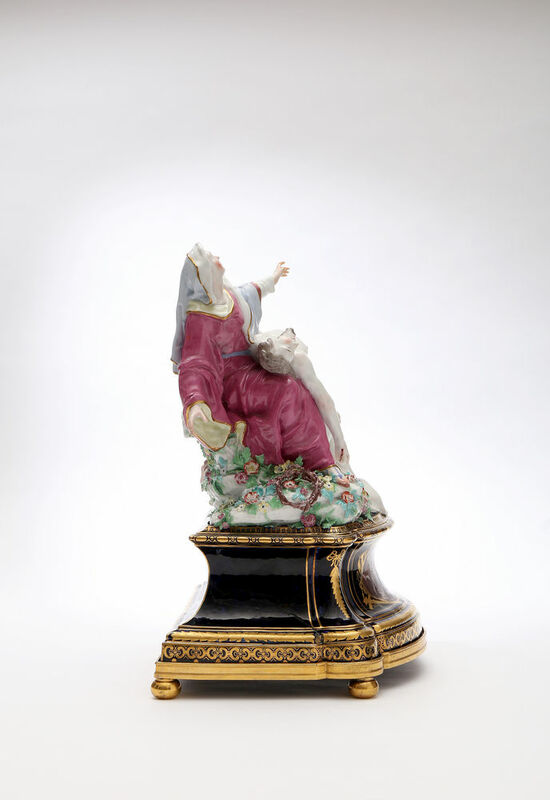 Our group is presumably the one mentioned in a London sale catalogue of Chelsea Porcelain, 2nd May 1761, lot 80, “A most Magnificent groupe of a MADONA and JESUS, curiously enamelled, upon a PEDESTAL of the fine mazarine blue enriched with gold”. (Mackenna Gold Anchor Wares, (1952), Appendix L, p.92.). 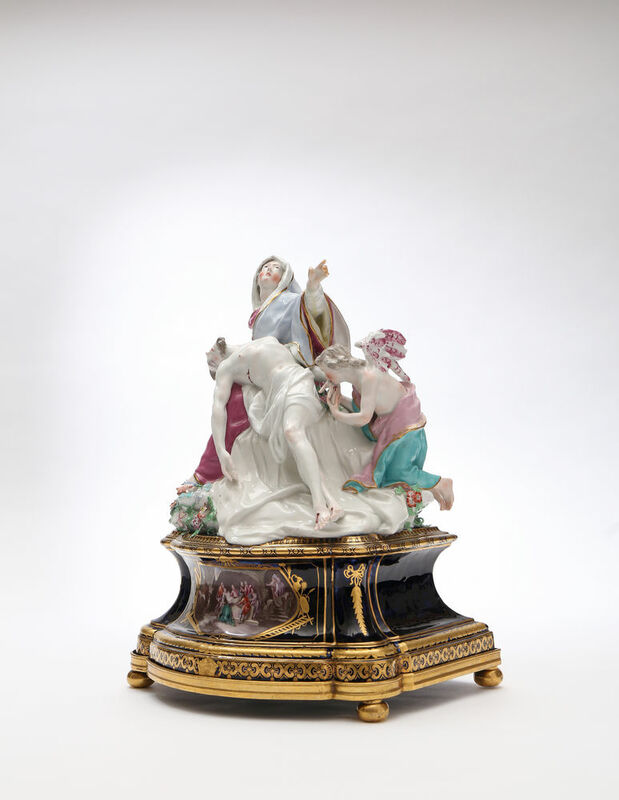 The integral porcelain pedestal is decorated on the front with a vignette with a similar subject from the Passion and Life of Christ, The Entombment of Christ. It is executed in polychrome enamels, within a tooled gold border with depictions of the Instruments of the Passion, the Arma Christi, including the cross, a ladder, the crown of thorns, a shield, ewer of gall and vinegar and flagellum. In the scene, set within a cave, an attendant holds two torches, while seven figures gather around a tomb, several in deep distress, while two women approach down a stairwell. 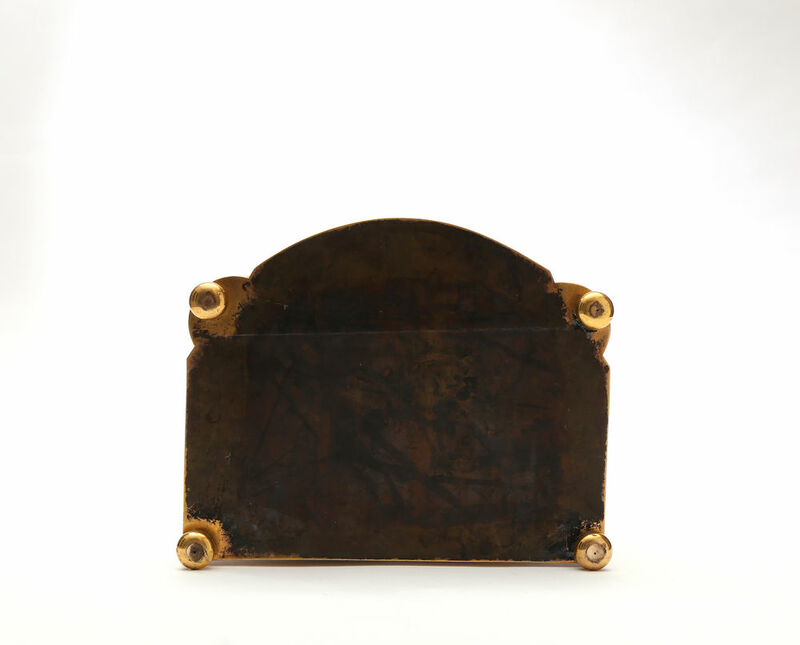 The source has not been identified, but the same subject, La Mise au tombeau appeared on a gilt-bronze plaque at the base of the Coustou sculpture executed by François Girardon (1628-1715), just visible in the Blondel engraving.6 The pedestal is in turn mounted on a gilt-brass or ormolu frame and raised on four ovoid supports. The other Gold Anchor period group has a similar pedestal, but in place of a vignette, has a gold Lamb of God inscribed ‘Agnus occisus a [sic] origine mundi‘ (trans. The lamb slain from the creation of the world. Revelations 13:8). The only other overtly Catholic model produced by Willems at Chelsea is a group of the Madonna and Child, for which both Red Anchor and Gold Anchor models are known. The Madonna and Child model was mentioned in the 1755, 1756 and 1761 sale catalogues. By 1761, during the Seven Years War, these Catholic subjects were clearly intended for the domestic market. Significantly, the Gold Anchor unpainted model in Melbourne was formerly in the collection of the Barons Clifford of Chudleigh, an important recusant Catholic family in the 18th century. Hugh Clifford, 4th Baron Clifford (1726-1783) was a patron of the arts, who engaged Robert Adam in 1763 to rebuild the family seat at Ugbrooke Park, which has within the house, a Catholic chapel in continuous use since 1673. Another recusant Catholic family presumably ordered this polychrome Gold Anchor period model for their own private domestic devotion. In 1766, Willems returned to Tournai to work, but died shortly after. 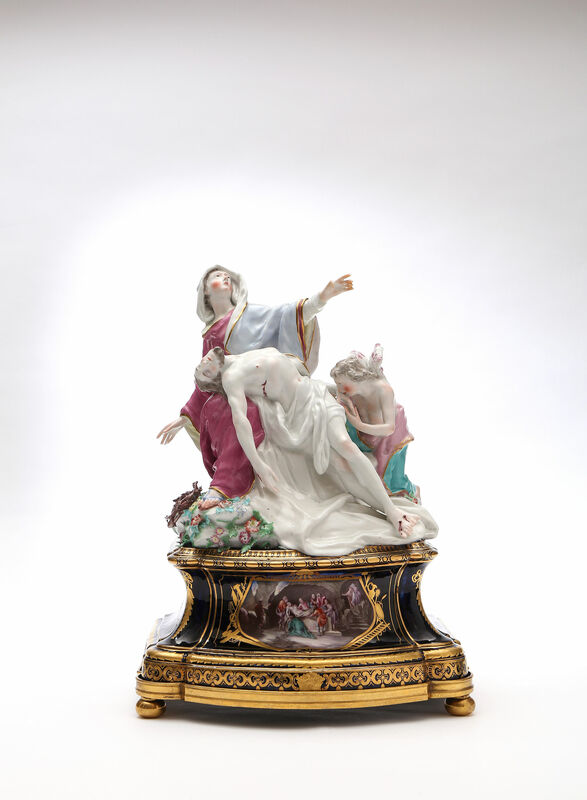 Significantly, a white-painted terracotta model of the group was in the inventory of Willems effects prepared in 1767. It was recorded as ‘un grouppe représentant la Vierge et le Sauveur descendu de la crois avec un adorateru‘.7 This model apparently served for the biscuit groups made at Tournai in 1766-7. Two examples of the Tournai model are known with some alterations and additions, including a cross, ladder and spear; a sculptor of lesser skill having completed the models. The Pietà is one of the most beautiful and ambitious works of Joseph Willems, Chelsea’s chief modeller, who brought his own native Flemish Roman Catholic art to bear as he transformed a public French liturgical work into an emotionally-charged object for private devotion. 1. J.V.G. Mallet, ‘Some Baroque sources of English ornamental porcelains’, in English Ceramic Circle, Fire and Form: The Baroque and its Influence on English Ceramics c1660–c1760, London: 2013, pp. 123–46, p. 130. 2. Bernard Watney, ‘Origins of Designs for English Ceramics of the Eighteenth-Century’, Burlington Magazine, issue 114, Dec. 1972, pp. 818–31. 3. For the earlier image see British Museum, M,37.31. 6. Martin, 2013, fn. 37, identifies a print illustrating a book engraved and published in 1788, after a drawing by Daniel Dodd (act. 1761-80), see 1939,1104.2. The undated drawing for the print is also in the British Museum, see 1939,1104.1. 7.Arthur Lane, English Porcelain Figures of the Eighteenth Century, London: 1961, pp. 135-6. 1. Polychrome model, Chelsea Porcelain Factory, Red Anchor Period, 1756-8. Victoria & Albert Museum, London, England. C.49-1985. Purchase. 2. 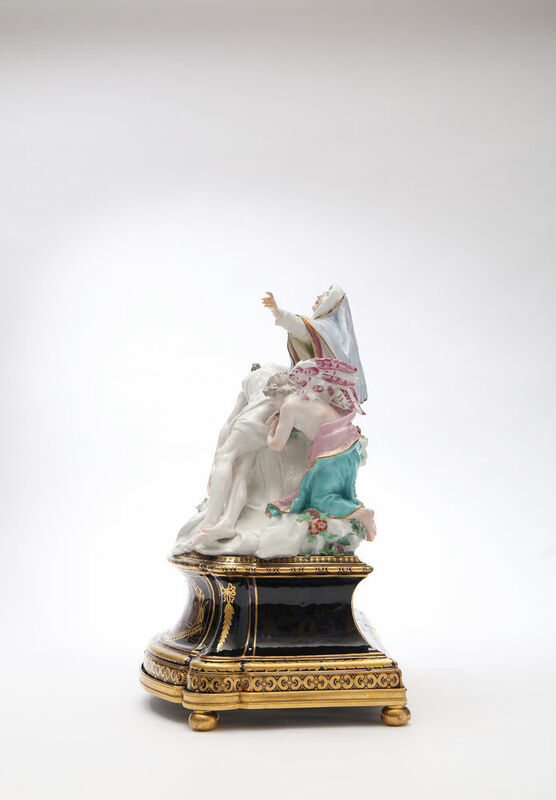 White model with mazarine-blue and gold pedestal, Chelsea Porcelain Factory, Gold Anchor Period, the gold anchor mark on the back of the plinth, c.1761. Literature: William King, Chelsea Porcelain, 1922, p. 52, pl. 64. where it is listed as ‘In the collection of Lord Clifford of Chudleigh’. 3. 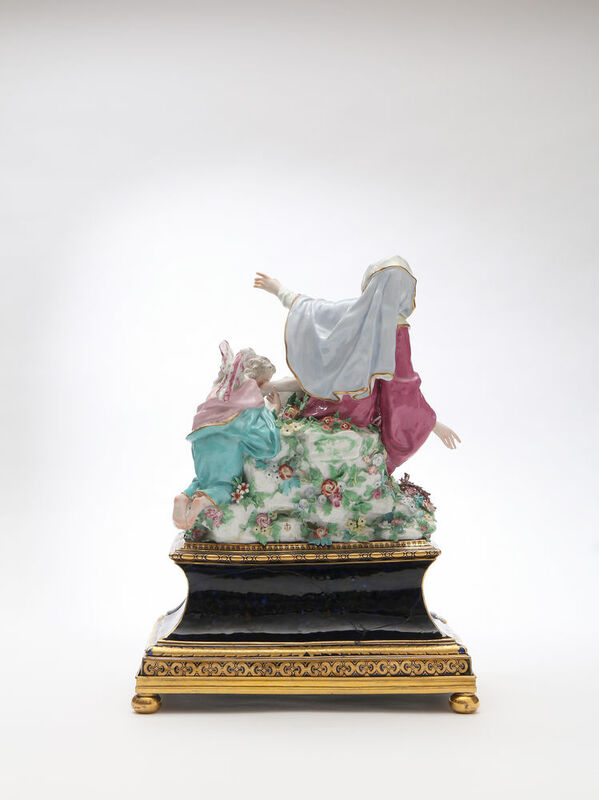 White biscuit model, Tournai Porcelain Factory, c. 1766, with an ormolu mounted base. Carnegie Museum of Art, Pittsburg, Penn. 63.17.3. 4. White biscuit model, Tournai Porcelain Factory, c. 1766. Musée Royal de Mariemont, Morlanwelz, Belgium. Condition – Fingers of the Virgin’s left hand with some old restoration. Extended original firing crack to reverse and one side of the plinth. Small chips. Robert Williams, Winifred Williams Ltd.
Christie’s, London, 11 February 1991, lot 90. The Property of a Lady of Title. 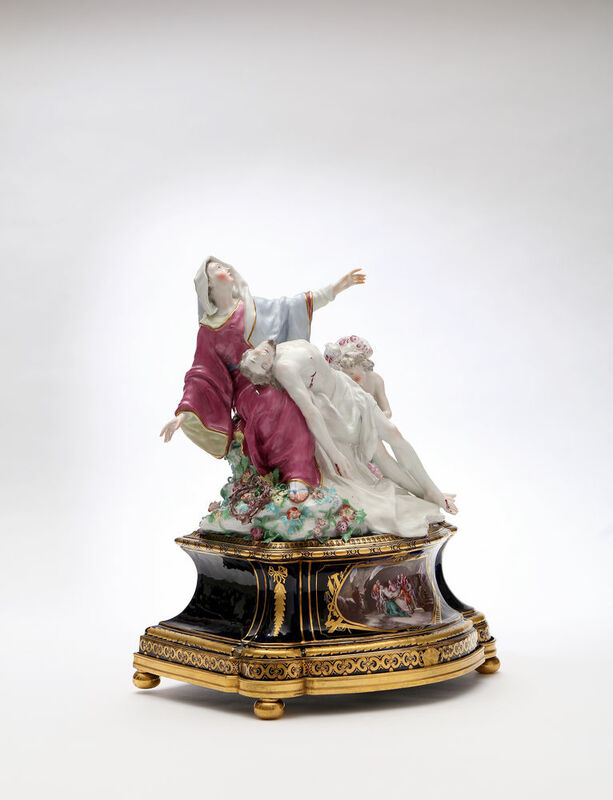 Exhibitions – Melbourne, Australia, 2015, Eighteenth-Century Porcelain Sculpture, 27 February to December 2016, National Gallery of Victoria.